MC2 Architects and MC2 Construction were founded on the belief that design and construction are inseparable. The firm was established in 1995 by Chuong Q.B Nguyen and Chung Q.B Nguyen to provide residential and commercial clients with the benefits of having every project component-from design through construction-informed and directed by a singular vision. The Nguyen brothers believe that both practical and aesthetic bonds intrinsically link the design and construction processes. For MC2, respecting those bonds produces the best combination of function, sensibility and good economics. MC2s building experience defines design and improves project economics. Direct involvement with construction also provides a clearer understanding of the challenges builders face. 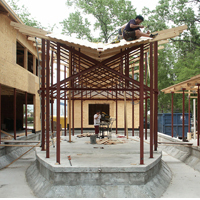 Early in their careers, the Nguyen brothers formed a framing and construction company. They have put in years of physical labor learning the building trades and developing a network of trusted subcontractors with whom they now work. This understanding of the construction process enables MC2 Architects to design and MC2 Construction to build in more intelligent and efficient ways. Design is intuitive and construction is developed over time. Understanding architectural materials is an art best learned through practice: nothing trains the intuition better than handling and working with the actual building materials. Each material has unique physical properties and characteristics as well as emotional content. This content transforms as materials are combined. The Nguyen brothers extensive construction experience furnishes that preparation and offers inspiration for MC2s designs. Combining design and construction oversight yields a more direct and more efficient construction process. It also means straightforward communication which accelerates project completion and ensures a clear interpretation of the original design vision. We are designer/builders because we believe bringing a design to reality takes a consistent vision and oversight. Direct design execution by the firm helps realize the project vision. Providing construction services allows MC2 to monitor the construction process more closely, give more personal attention to detail and shape the project during construction.MC2 Architects designer/builder role gives the architect and client better control of project execution for better results. Building encompasses a significant span of time during which the execution of innumerable steps control the destiny of the space. In that way, building is definitely a marathon. The joy is seeing what you have accomplished in the end. To us it is always thrilling to stand before a physical structure that was conceived on paper just a few months earlier. We’ve been very pleased that our clients consistently validate our design/build concept. Here’s what some of them say.